08Romeo departing KILG - photo by Vince G.
Well after a few weeks of searching and looking at various units Mary and I closed on a motor home. 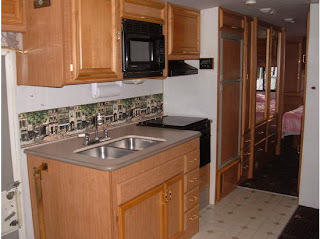 Yes, we will now have a 'beach home' on wheels, in Ocean City Maryland. We gave some thought to a unit in Maine for just under what we set as our limit but decided to fly up and back at least twice and drive it home would balance out for what we were going to spend locally. We decided to take 08Romeo to Allentown/Queen City airport' KXLL. The wx was perfect this morning and we had a nice tail wind. Mary got to try her new Bose headset and she loved it! She could hear the music and could hear approach control much better than before. We were both excited but we wanted to stick to our plan. This was a fun flight to a new airport on our list. We've passed over this airport many times on our trips to/from Wilkes-Barre. 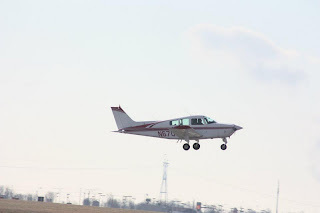 It was a smooth landing and taxi to the FBO on the field. We secured 08Romeo, checked in and called a taxi. A quick hop uptown and $10 later we were at the RV dealer. We were given a tour of the unit and then left alone to investigate and make a list of questions. 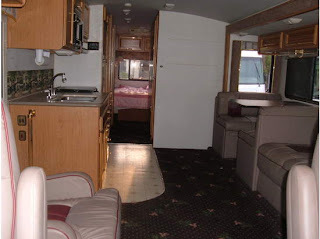 We went through this motor home like two inspectors on a final walk through on one of my construction projects. I went through the outside and Mary started on the inside. We compared notes investigated some things again together and then met up with the sales person, Brandon. The only thing we didn't do is fire up the AC units, heater and water flows. He assured me it all worked and they would have it ready to test when we came back to close the deal. We haggled on the price, got the roof to be resealed along the perimeter and penetrations along with a small punch list. Mary and I were satisfied and made an offer. I like to horse trade but I did have to increase my bid a bit to close the deal. We were happy with the final price and the unit. We will fly back in a couple of weeks to drive our 'new to us' home away from home beach house back to Delaware. We want to do a few things to the inside, like change out the curtains and give everything a real good cleaning, plus stock our "stuff" where it will now go. Of course we will have to get Maggie used to climbing in and out and letting her get settled in. 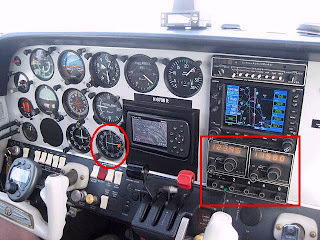 I previously posted about upgrading the avionics in 08Romeo and today I agreed to my plan 'B' with Red Eagle and scheduled for March 1. I am going to keep the Collins Nav/Com equipment since they both work and just upgrade the transponder so I can have the Zaon traffic back online. Besides, the Garmin 327 adds many features the Collins 950 did not have. The second part of plan B is the Garmin 530 WAAS upgrade. The 530W is approved to fly LPV “glideslope” approaches without reference to ground-based navaids of any kind. The 530W features an advanced 15-channel receiver capable of five position updates per second, GNS 530W also meets the FAA's stringent TSO C146a standards for WAAS "sole means" navigation, providing vertical and lateral approach guidance into thousands of U.S. airports previously inaccessible in IFR conditions. The GNS 530W is an all-in-one GPS/Nav/Comm solution. It will feature a WAAS-certified GPS, 2280-channel capacity comm and 200-channel ILS/VOR with localizer and glideslope. Traditionally it would take a host of components to provide the capabilities of this one smart box. High-speed 5 Hz processing makes navigation calculations and map redraw rates five times faster than earlier GNS series navigators. It looks like I will have two 430/530 Data cards for sale soon! 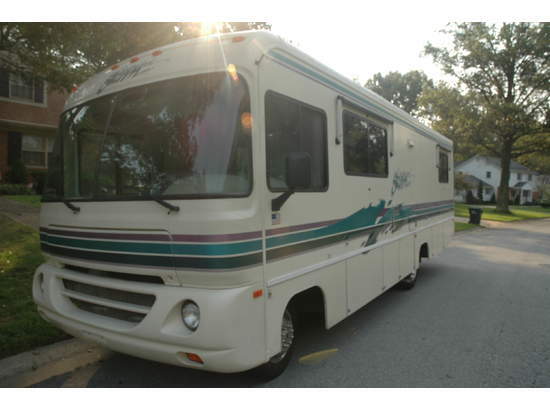 Well Mary and I have added another RV to the search. We plan on flying to Queen City Saturday after checking out the local RV. 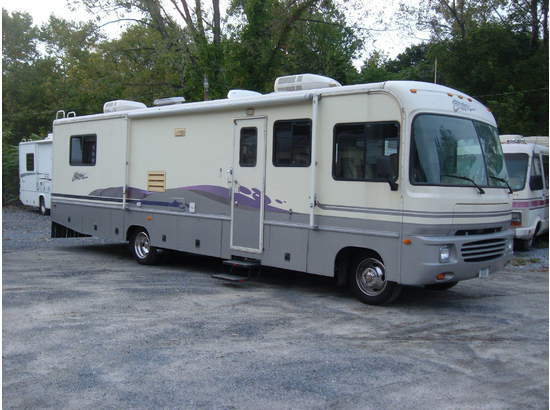 The new unit added to the list is a 1997 Fleetwood Storm 35. 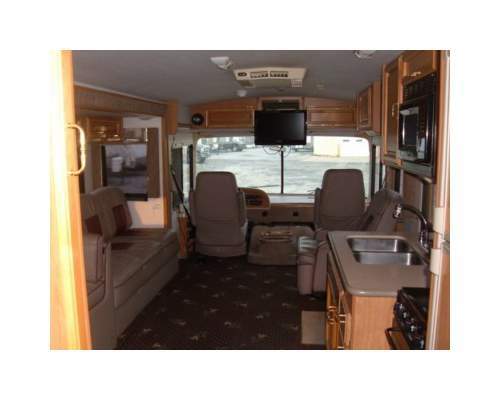 The Fleetwood Southwind Storm 35 has one slide-out (expandable living room)it sleeps up to six. The unit has a queen bed, sofa conversion, dinette conversion. Chevy Chassis, gasoline 454 cu.in., with automatic transmission with overdrive, tilt steering, cruise control, AM/FM/CD dash radio. This motor home includes a patio awning, electric entrance step, hydraulic leveling jacks, rear ladder, 5.0 kW Onan generator, exterior storage compartments, two ducted roof air conditioners and dash air conditioning, ducted furnace, kitchen: with refrigerator, freezer, 3 burner stove top, oven, and microwave. The unit has a full bath and shower with skylight. UPDATE: The first unit I looked at and Mary and I were scheduled to see agin on Saturday was SOLD. I just got a call this morning (Friday)from the owner. I had some time today to meet up with the owner of the Fleetwood Storm 30, Class A Motorhome Coach we are thinking about buying. Finally a chance to get hands on and really give the unit a good once over. Overall the unit looks good, it needs a good detail (wax). Generator fired up and ran fine, heater too. I forgot to write the tire date down but plenty of tread and no cracking or signs of dry rot. 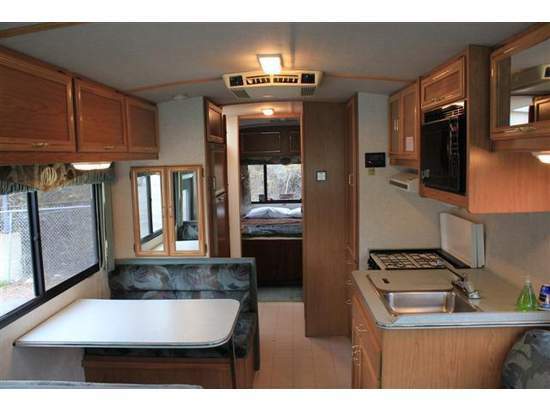 I'll get on the roof Saturday and get a closer look at the caulking, vents and solar charger. I crawled around the storage areas and found no signs of leaks. Awnings looked very good, no cracking, bright colors and all deployed/retracted well. On to the interior. Carpet on the steps was dirty and stained. The remaining carpets were very good. Furniture cushions looked brand new and the cushions were firm. There were no signs of leaks in any cabinets or around any windows or trim. The only spot I did find was a small stain where you fill the water holding tank. It was inside a cabinet just to the left of the entrance and located directly below the fill hose clamp. The bathroom floor was tight and under the sink, leak free. The owner did mention he left the vent cracked open this past weekend when we had snow flurries. A few drawer faces had the veneer type wood grain peeling off, by the bedroom heat vent and kitchen heat vent, seems to be an feast fix. The unit is winterized but if we decide to buy I want to test the total system, if everything works I'll pay to winterize again. The owner said he paid $90. If the systems don't work it's on him. I'll have to test the ac unit too. Saturday the Bride gets to see the unit and from there we'll decide. 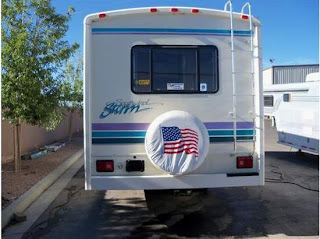 I did make contact with a few RV Parks and have multiple potential seasonal hook ups available. 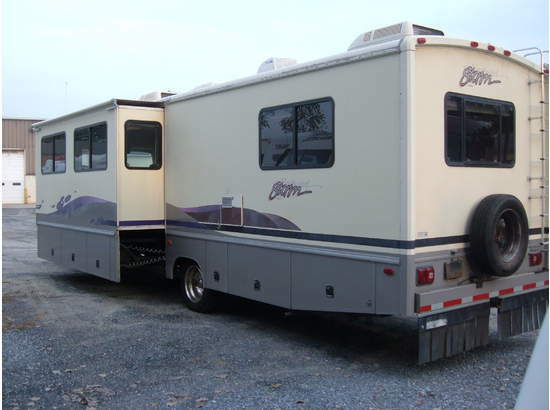 More to follow....for our potential summer home on wheels. KILG early AM,,,,picture from Ben Clendaniel. 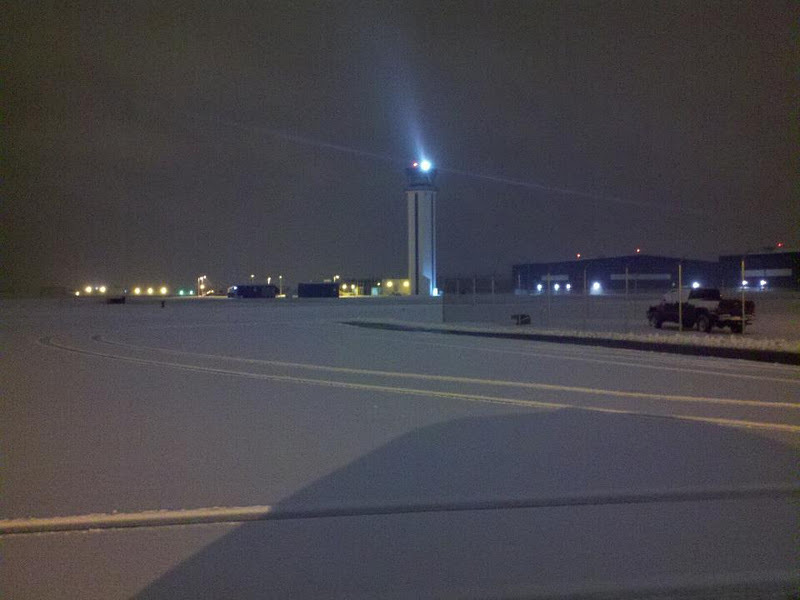 ﻿Overnight, Wilmington got its first real taste of winter with a coating of snow. The forecast was calling for a coating to one inch but after walking Maggie this morning I would say it's closer to three. Right now we are getting freezing rain so we'll see where the totals end up. Despite the outdoor winter wonderland Mary and I have been entertaining the idea of purchasing a Class A RV motor home. A self-contained motorized RV that looks something like a bus, often referred to as 'a coach'. 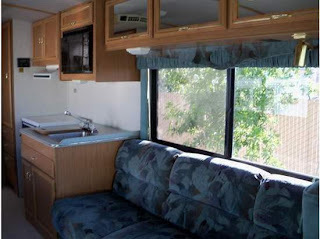 Built on a special chassis, the class A has all the comforts of home. Floorplans typically include separate living quarters, a fully equipped kitchen, dining area, one or more bedrooms, and one or more bathrooms.It does not have a separate cab; The driver sits at the front of the coach. 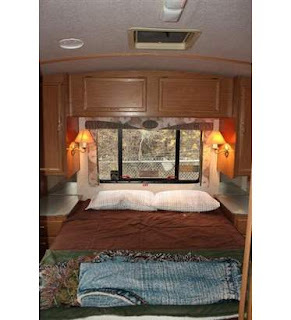 Class A motorhomes vary in length from approximately 25 feet to 45 feet, and can be powered by a gas or diesel engine. They are often equipped with a generator to provide 120V power for appliances. We gave some thought to purchasing a condo but the financial ties would restrict our desire to really travel. Mary loves the beach so for the summer time weekend get-away and the opportunity to take Maggie with us the RV fills the need. A seasonal hook up and then winter storage will still allow plenty of travel to new locations with 08Romeo. A home away from home at the beach will be a welcome get-away from Wilmington and provide the opportunity to enjoy evening boardwalk strolls and the sun and sand during the day. We are going to look at a thirty foot Fleetwood Storm RV on Sunday. The unit seems to be in very good condition and it has low miles. It's exciting to think of the weekend hops in the plane to/from the beach and taking the time to relax without having to load up and fly home at the end of the day. Our plan is to bug out after work on Fridays and not return home until late Sunday afternoon or early evening. Either departure time will not be affected by the typical beach traffic that really backs up every weekend. More news to follow, hopefully with pictures of a new beach home, on wheels. I got up around 5am and got Maggie outside then fixed her breakfast. My Bride was still tucked in bed, snug as a bug. I was surprised to see it snowing when Maggie and I did our abbreviated walk and I was worried the forecast had changed enough to cancel my flying for the day. With the zoo taken care of I updated my flight plan. Actually the wx was looking great if you could handle the cold temps. 08Romeo was plugged in Friday so she was ready to go. I grabbed a bite to eat, left over Helen's sausage sandwich, and then hit the showers. Not much traffic to the airport and the ramp was a ghost town, as usual. I guess they all have an excuse today, you have to be nuts to be out here in the cold. Well nuts fits me just fine I want to knock out some approaches. Mike, my normal safety pilot, was not available today so I posted on Facebook for a volunteer. Adam Z agreed and we would meet at Wings Field at 9 am. Pre-flight completed and the last item is to pull the nose plugs, check my alternator belt and engine area then unplug the Reiff heaters and secure the oil access door. Seven shots of primer and 08Romeo roars to life with her oil temps well into the yellow and just shy of the green range. I made my call to Wilmington ground noting just VFR this morning since the wx was good (I had filed just in case). Wilmington gave me a squawk code which was really nice and I taxied to runway two seven for departure. Wilmington turned me loose and Philly cleared me through the class bravo without asking, clean living I guess. Nice short cut in the 25 knot head winds that made the normal trip an extra 12 minutes. Traffic was in the run up area for runway two four as I crossed midfield for the left downwind runway six. Winds were 320-350 gusting, I'm not sure what the other guy was thinking but hey, he's the PIC for his flight. Adam Z climbed aboard and we were soon launching for Pottstown Heritage field, KPTW. First up was the Localizer RWY 28 approach with vectors from Adam. I struggled with the foggles since my flip shades were broken, what a pain. I made my way in, holding a nice course but a bit fast. A low approach only followed by a climb out for the GPS RWY 28. I made the swap on the iPad for the correct plate then got back to business. This approach went fine, good tracking and nice speed control all the way to the MAP. Did I mention that Adam failed my Attitude Indicator? Yep, he did, nice guy huh. I flipped the 496 screen to the six pack and had that as my back up since my scan now changed due to the failure. Again I went missed and climbed out for Brandywine Airport, KOQN. Around the cooling towers of Limerick Nuclear power plant and on course for the GPS RWY 27 into Brandywine. It feels good to knock of the rust as I track nice and manage my speeds. Another low approach and a missed followed by a climb out to the Modena VOR (MXE). This VOR 'A' approach will need the Procedure Turn (PT) and then track inbound, back to the airport. I track ok as Adam catches me in the GPS mode on the 530, which I like to do. I am tracking the VOR on nav2 so I'm good to go. I like the GPS mode, I trust it more than the VOR/VLOC mode. We finish up and point 08Romeo back to Wings field. Adam takes over and does that pilot stuff as he knocks out the GPS RWY 6 approach. For as bumpy as it was and time between approaches I thought he did a good job. As Adam said, "I would have gotten us here without killing us", I'd have to agree, good job. I dropped Adam on the ramp and turned for home. I was cold and wanted to get home and watch some football. I scooted along at 2200 feet under the Philly Bravo airspace and contacted Wilmington 10 miles out to the north. I was directed to a right down wind for runway one report mid-field. I acknowledged then landed long for taxiway kilo, I was home. In my previous post I made a quick stop at the airport to get 08Romeo plugged in for some pre-heated weekend flying. I failed to mention that I forgot my keys and had to ask the Avionics shop to lend me my spares I keep locked up with them. It saved me a trip back and forth and got 08Romeo taken care of. One of the drawbacks to walking in the avionics shop is the urge to window shop. I had been on the fence about updating my nav/com 2 from the Collins 351/251 and my Collins TDR950 transponder. I really want the added standby frequencies and flip flop capability on com 2, along with maintaining the second glide slope with nav 2. My Collins TDR 950 transponder has a problem with my Zaon traffic unit presenting bogus targets following me at 200 feet high or low, it's annoying. I priced out a few different units and was offered a unit from Garmin, the GTX 327 for just one AMU, it's a great deal. 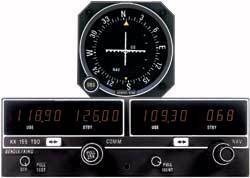 The resale value of the Collins 251/351 Nav/Com is around $350 for each and the TDR 950 is going for $600. I figure with resale I should recover $1000-$1300. $5650 initial cost minus the resale of current equipment $1200 leaves a balance of $4500.00. I placed my name on the schedule....God help me. It's that stinking time of the year, yes, winter is here. No snow yet but cold temps with a wind chill factor and gusty winds hitting 50 mph. I made the quick trip to the airport to plug 08Romeo in for the first time 'this year'. Maybe I can fly this weekend or Monday, since I am off for the Holiday. 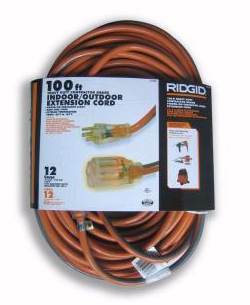 Three 100' 12/3 extension cords to get power to the plane. My always faithful Reiff heaters, consisting of 50watt band heaters on each cylinder and a 100 watt pad on the oil sump. I've considered adding an oil cooler heating pad but since I keep it plugged in all night and cover with a padded moving blanket, 08Romeo will be fine. Last but not least a gallon of Peak RV antifreeze and a one gallon pump sprayer for the frost. I'll be on the ramp with a heavy jacket, leather fur lined gloves, ear muffs and scarf. I sure wish we had a hangar! Mary and I have went back and forth on her headset. 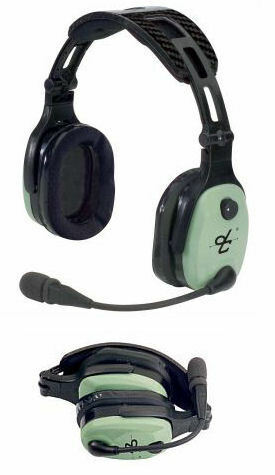 Our first headsets were the David Clark H10-13S model, great headset. With the purchase of our own plane and many more hours of planned flight we each decided to upgrade to ANR's (Active Noise Reduction). I purchased the Lightspeed Zulu's with bluetooth capability. A great function when trying to pick up a clearance or release with the fan already turning. Bluetooth compatible: Wireless phone and music interface with controls is embedded into the battery box. Comm. Priority Mute: Circuitry gives priority to incoming radio calls, automatically muting the aux music source. Audio System: Full wireless stereo interface with patented Front Row Center (FRC) audio circuitry. One wireless audio input and one wired. 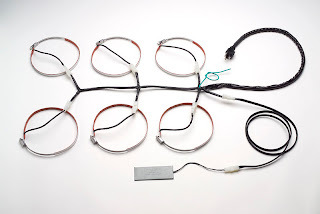 The Zulu FRC solves the problem of left/right channel isolation on stereo headphones. The processor closely matches the shadowing affect of the head for the crossfeed signal to the left (or right) ear. The signal is both amplitude and delay corrected to compensate for the increased distance the sound would travel. The results are extremely pleasing and akin to switching from mono to stereo. Mary didn't want to spend the extra money for something she didn't need so she decided on the David Clark X11 headset. She really liked her first set and wanted to stay with DC's. We purchased the X11's and they served her well. Very lightweight (12oz) and no clamping pressure, this was the ticket. Over time we realized that the DC's didn't produce the same quality sound when we played the xm music and selections from her iPod. It was time for a change. 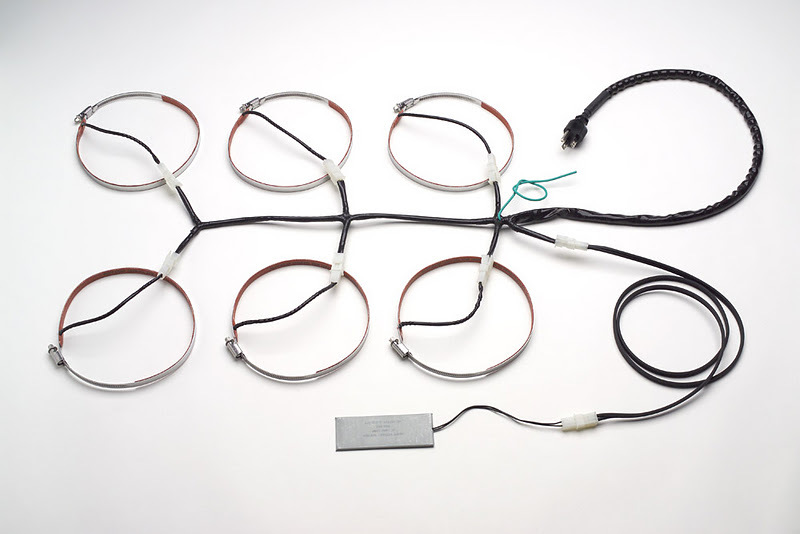 David Clark Company developed the Electronic Noise Canceling Headset System. (ENC). Active reduction of unwanted noise is achieved by a process which amounts to cancellation of the noise by generating a signal identical in sound pressure level (SPL) but exactly reversed in phase to the offending noise; the effect being a cancellation. We sold her X11's and purchased a set of Bose X. This is a really nice unit and will provide excellent sound quality when she turns up the tunes! Another set of minimum clamping pressure and again very light weight at only 12oz. 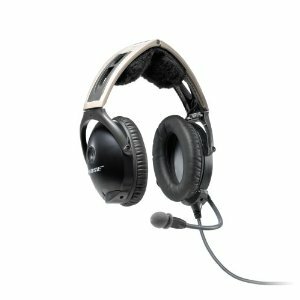 A rare combination of benefits helps distinguish this headset from all other pilot headsets. Most importantly, Acoustic Noise Cancelling® headset technology, pioneered by Bose, dramatically reduces the engine roar you hear in the cockpit. Small microphones in each earcup monitor ambient sound. Innovative electronics immediately identify the unwanted noise and create an opposite signal to reduce it. The result? You hear dramatically less engine noise, and more of your communications. This advanced noise reduction technology combines with exclusive Bose headset design and active EQ to provide you with quality audio in a compact headset weighing only 12 ounces. With lighter, more compact earcups, Aviation Headset X requires significantly less clamping force than most noise reduction headsets. Many pilots say this easy-on-the-head design makes a big difference in how they feel after a long flight. The solid magnesium headband is also extremely lightweight and durable. A sheepskin cushion eliminates hot spots, and soft ear cushions provide an effective seal, even over glasses. Proprietary AdaptiSense® headset circuitry gives you at least 40 hours of headset use from just two AA alkaline batteries. 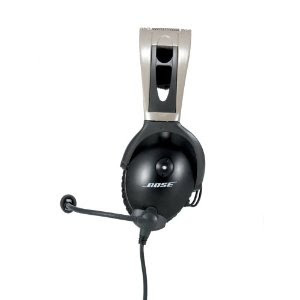 This Bose innovation automatically adjusts the headset's need for power according to the levels of cockpit noise and radio communications. TIA's, no this is not an aviation term, however, it is a serious medical condition. 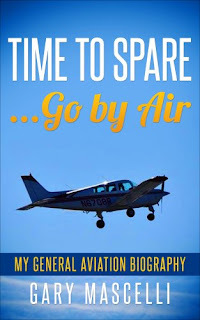 Flying seems so trivial when we are faced with medical emergencies that effect us and/or our family. My beautiful Bride had her blood pressure spike which resulted in signs of a stroke. A transient ischemic attack (TIA) is when blood flow to a part of the brain stops for a brief period of time. 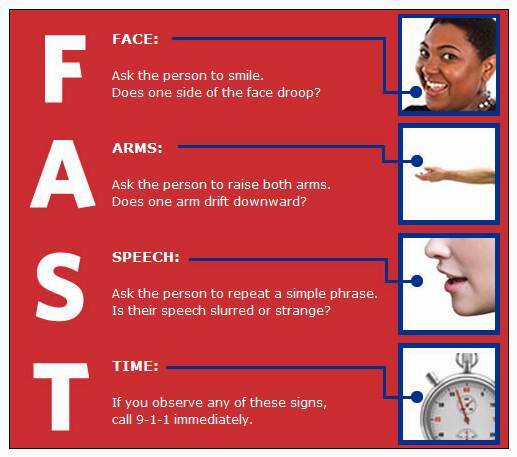 A person will have stroke-like symptoms for up to 1-2 hours. A TIA is different than a stroke. After a TIA, the blockage breaks up quickly and dissolves. Unlike a stroke, a TIA does not cause brain tissue to die. TIA's do not cause lasting damage to the brain. High blood pressure is the number one risk for TIA's and stroke. Mary is home and doing very well. Life is back to normal, whatever normal is in our home. The cats are happy and our Italian Mastiff is happy that Mom is back. I can not tell you how happy I am that Mary is home, with no lasting affects and able to continue with life as we know it. We each got a good scare this week. The need to continue with our revamped diet and add more exercise to our routine hits home even more. I decided to start the year off right with a short flight today. The wx is perfect and it's going all downhill the rest of the week. Mary passed on breakfast so I sent Vince a text and posted on Facebook. Jeff in Woodbine posted that the Woodbine pilots are heading to Georgetown -KGED, great, I'm in. I quickly uncovered and pulled out the one gallon sprayer I had stowed in the baggage compartment earlier in the week. A few pumps for pressure and a light spray had the frost rolling of the wing. I completed my pre-flight and turned 08Romeo into the sun while I parked my SUV outside the gate. I sent Vince a text that I am wheels up in five minutes, no answer. I was already warming up the oil at low idle and had just released the brake when he sent a text. I responded,taking off - catch up next weekend. I felt bad but I really wanted to get to GED while the Woodbine pilots were still there. I launched for Georgetown and once turned on course and approved for a frequency change I turned up the music. I did dial in Dover Approach since I would be flying over the air base at three thousand feet. I watched a C5 take off and turn out towards the Bay and the young lady flying that heavy was alerted to traffic south bound at my altitude, yep, it was me. I contacted Dover, stated my position, altitude and that I had the heavy climbing over the Bay. They gave me a squawk code and we road along together. I guess I was ten north of Georgetown when I canceled flight following and announced my position on unicom. There was a plane working in the pattern, one just ahead of me joining number two behind the pattern guy, myself and one other heading in. I crossed midfield for the left down wind runway two two and made an ok, "flat", landing. I taxied in and secured 08Romeo then headed for the restaurant. ﻿Good eats at the breakfast buffet and great conversation, always good for some laughs. We squared away the bill and headed out to the flight line. I was number four for departure and heading north. The winds had picked up but I would have a tail wind for my ride home. The sky was clear, despite the brown mucky layer in the distance. I rode home with good ground speeds and listened to the 70's hits. I did monitor Dover since I would once again cross over the field. Got lucky again as I watched a 747 take off opposite direction and climb out towards the bay. I wonder if I look like a bug on their windscreen? 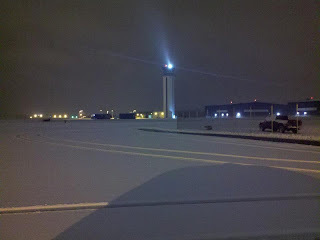 I contacted the Wilmington tower and acknowledged a left down wind for runway one niner. I felt better with a smooth landing on this leg, having to add power to make the first taxiway. All secured I said goodbye to 08Romeo and headed home. Welcome to 2012! !